This collection of insect inspired patterns was done in collaboration with Malabrigo Yarns for the Malabrigo Freelance Pattern Project. This hat has a great squishy fabric! The broken rib slipped stitch shows off hand dyed yarns nicely and creates a warm waffle fabric. It’s my new favourite hat. It has a bit of slouch and is perfect for gift knitting. 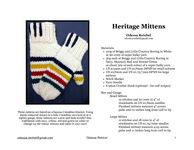 These mittens are based on a famous Canadian blanket. Using iconic coloured stripes in a lofty Canadian yarn knit at at a tighter gauge, these mittens are warm and look terrific! Stay traditional with navy, yellow, red and green on white or change up the colour scheme and make it your own! Featherlite is a simple slouchy ribbed hat knit using two lightweight yarns held together with the subtle tweed of Shibui Pebble or Rowan Valley Tweed blending beautifully with the halo of the Shibui Silk Cloud or Rowan Kidsilk Haze. 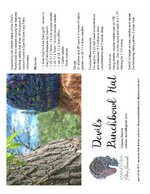 This chunky hat is knit from the bottom up in the round. It has a cozy wide ribbed brim. The body of the hat features a large cable among a broken rib patterning. This bold graphic hat is knit in the round from the bottom up with simple geometric colorwork patterning. The hat features a wide brim and a gathered top for a casual slouchier look. Blocked on a plate it makes a great beret-style hat. This bold graphic hat is knit in the round from the bottom up with simple geometric colorwork patterning. The hat features a wide brim, longer body and gathered top for a casual slouchy look. Organic forms and butterflies melt together to create an intricate pattern. These mittens start with some garter stitch stripes, have an afterthought thumb and are grafted together at the top. These mittens are inspired by the oil slick sheen of the Jewel Beetle. With organic shapes based on the insect’s form they show off rich yarns well. They start with a corrugated rib cuff, have an afterthought thumb and are grafted together at the top. This bold graphic cowl is written in two different yarn weights, bulky and worsted. The patterning is based on the wide Leaf Eater Beetle. This cowl is knit circular with corrugated rib framing the colorwork beetle pattern. This simple shawl is knit from the bottom up and features short row shaping to create a graceful crescent shape. Instructions for adding beads are included which gives the shawl some extra shine and drape. Both written and charted instructions are given for the lace edging. A queen bee in a field of honeycombs. I was really inspired by the colors found in a skein of Malabrigo Sock in Turner with dirty yellows, grays and hints of purple to create a mitten with one of my favorite bugs on it. These mittens start with a Latvian Braid, have an afterthought thumb and are grafted together at the top. Knit out of luxurious silky merino, this hat and mitt set is inspired by patterning found in moths. The hat features a wide rib brim and simple patterning using four different colors, but never more than two per row. The mitts are knit using the same motifs and have an afterthought thumb. I came up with this simple bias knit scarf because I wanted to show off a small amount of crazy & pretty handspun I had. This scarf can be knit with any weight of yarn. These mitts are a playful take on traditional Fair Isle motifs using robots and robot imagery inspired by futuristic movie robots of the 1950s. These mittens are playful and full of color. 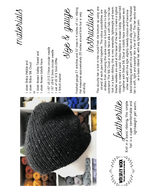 The pattern includes two sizes, achieved by different needle sizes, and two different charts, one for knitting with many colors to create a multicolored effect and one using a color changing yarn against a solid color that does all the work for you with minimal ends to weave in. A perfect hat for the little (or not so little) monster in your life. Using bulky yarn and US 10 needles, this is a quick knit! Leave it plain for a fun shaped hat, add strings to tie under the chin, or go all the way with button eyes and an embroidered mouth, there are many ways to customize this hat for whoever is going to wear it. This pattern actually contains two separate patterns with the same basic instructions.